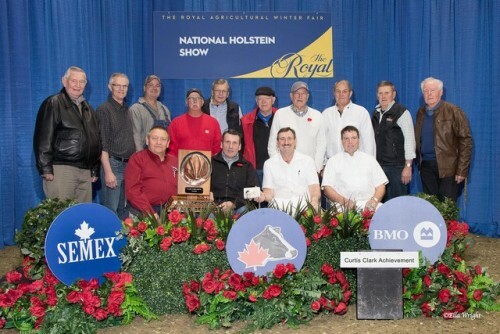 Don Chalack of Wendon Holsteins, Red Deer County, Alberta, was named the 2018 winner of the Curtis Clark Achievement Awardon November 9th during the Royal Agricultural Winter Fair in Toronto, Ont. Chalack is the 32nd recipient of this award which was established by the Alberta Holstein Branch in 1988 to honour the late Curtis Clark of Acme Holsteins, a respected Alberta Holstein breeder, cowman and showman. 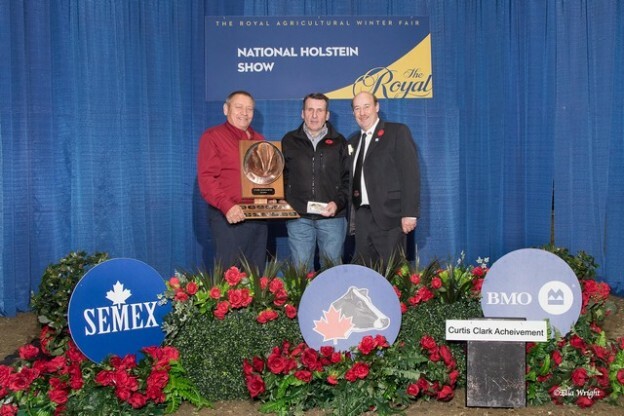 A breeder, showman, marketer, judge, volunteer and industry leader, Don Chalack checks all the boxes when it comes to what the Curtis Clark Award stands for. Chalack was raised on his family’s Master Breeder winning Ultra Holsteins farm at Cochrane, Alta. In 1976, Don and his wife Wendy purchased a farm near Innisfail, Alta., and established Wendon Holsteins. There, along with their three children, they have gone on to breed and develop a herd that has earned Holstein Canada Master Breeder awards in 1995 and 2008. Their son, Logan, farmed with them until his death in June 2016. The couple, along with their daughter Jillian and son-in-law Scott Hastie, currently operate Wendon Holsteins in a 60-cow, free-stall robot barn with 12 tie-stalls. Another daughter, Linsey, helps on the farm whenever she can. Six grandchildren, and Logan’s wife Charity, round out this close-knit family. An astute cowman with a keen eye, Don Chalack made numerous purchases early in his career which produced a number of show winners. Today, he and his family are best known for the success they have achieved with homebred Wendon animals. By building on such deep-pedigreed cow families as Wendon Triump Alaska (Ex-91-2E-6*), Wendon Gibson Prudence (Ex-92-5E-7*), Wendon Starbuck Renette (Ex-3*), and Wendon Triumph Divine (Ex-94-4E-13*), the Chalacks have bred to date 110 Excellent and 406 Very Good cows, plus 58 Star Brood cows. The Wendon herd is presently 90% homebred and consists of 28 Excellent, 49 Very Good and five Good Plus cows who average 11,200 kg milk with 4.1% fat and 3.2% protein. Don, 66, started showing cattle as a youngster with his parents, Margaret and the late Sam Chalack, and brothers David, Tim and the late Tom. He has continued to show ever since, exhibiting at all the major shows in Western Canada, as well as having had cattle shown many times at the Royal Winter Fair and World Dairy Expo. While more of a “back of the barn type of guy” now, Don was a great showman in his day. Wendon Holsteins has won many champion rosettes, Breeder’s Herd classes, and All-Canadian, All-American and All-Western awards. Among the Chalack family’s most cherished achievement was winning the Premier Breeder and Premier Exhibitor banners, and having the first prize Breeder’s Herd, at the 2016 National Convention Show in Calgary, Alta. Among Wendon’s recent show winners are cows like Wendon Goldwyn Diode (Ex-96-3E), grand champion at Westerner Dairy Showcase in 2018 and British Columbia Spring Show and Calgary Dairy Classic in 2017 and Honourable Mention All-Canadian mature cow in 2017; Wendon Golddust Dividend (VG-88), intermediate champion at Westerner Dairy Showcase in 2017 and reserve intermediate champion at Calgary Dairy Classic in 2018; and Wendon Destry Rainy (Ex-94-3E), grand champion at Alberta Dairy Congress in 2016 and a member of Wendon’s Honourable Mention All-Canadian Breeder’s Herds in 2016 and 2017. Chalack has also merchandised a number of animals who have realized showring success for their new owners. This list includes Wendon Dempsey Prude (Ex-95), All-Canadian and All-American 4-year-old who was reserve grand champion at World Dairy Expo and grand champion at the Canadian National Convention Show and B.C. Spring Show in 2016; Wendon Goldwyn Allie (Ex-95-2E-2*), 2012 All-Canadian and All-American 5-year-old; and Wendon Windbrook Mercy (Ex-92-USA), 2015 All-American junior 2-year-old. Chalack is an Official Judge and has judged shows in Canada, the United States, Mexico and Colombia. He has been a member of the Dairy Cattle Committee at Westerner Dairy Showcase in Red Deer, Alta., for 40 years and also served as the committee’s chairman. He was one of the founders of the Western Canadian Classic (WCC) Junior Dairy Show. He has also been a director and president of the Alberta Holstein Branch, a director of the Central Alberta Holstein Club, a 4-H club leader, and a member and chairman of Holstein Canada’s Type Classification Advisory Committee. He has been a mentor and friend to many. The Chalack family received the Alberta Breeder of the Year award in 2004, the Robert “Whitey” McKown Master Breeder award at World Dairy Expo in 2017, and were this year’s Breeder of Distinction at the TD Canadian 4-H Dairy Classic. Chalack is a quiet, modest man of few words whose breeding of great Holstein cows with deep pedigrees and show winning type speaks for itself. He is the “complete cowman”. He is extremely grateful for the continuous support of his wife Wendy who he says is the “backbone” at Wendon Holsteins. Don Chalack is humbled and honoured to be added to the list of Curtis Clark Award winners. Curtis Clark was a neighbour and mentor to Don and his brothers as they grew up. The first four purebred Holsteins at Ultra Holsteins were purchased from Curtis Clark and his partner Lloyd Pickard. The Curtis Clark Achievement Award is presented annually at the Royal to the Canadian dairy cattle exhibitor who is respected for his ability, sportsmanship and dedication. The winner, who is chosen by former recipients of the award, receives a gold belt buckle as a personal keepsake and has his name engraved on the distinctive Clark trophy that bears a bronzed version of Curtis Clark’s hat.